Consistent in timbre across it’s range, the flute may be the ideal instrument for complex arrangements of pitch and rhythm. 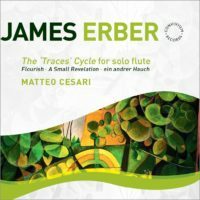 Traces is a mammoth hour-long three-parts opus for solo flute (2-:06, 17:57, 22:17). Everything about it suggests meditated conflict: A profusion of notes which eventually slows is balanced against a gradual but insistent introduction of different registers and volumes. Noting these gradual changes is one way to get into the material. I approach it as one might watch the leaves rustling on a tree: focusing alternately on the leaves, or branches, or the space behind the leaves, or how the leaves and branches pass through the same space as the wind blows. Despite the apparent years between parts, each segment does not appear to be arbitrary. The first part, Traces, seems the most frenetic even as gradually contrasting material in different registers makes its presence known. In Traces B clicks and key sounds appear more often; pauses in surprise in Traces C. The series closes wistfully as if unwillingly to let go. Cesari embraces the virtuosic triptych calmly. In the first part there’s a lengthy passage where frenetic high notes alternate with quiet low ones, and Cesari makes it sound easy. The three other pieces are digestible workshop chips. Ein andrer Hauch is for piccolo and blisteringly high. A Small Revelation commemorates Fernyhough’s 70th birthday. The miniature, Flourish, sets up Erber’s concerns: contrasting fast and slow material in different dynamics and articulations. La Folia was originally sponsored by Madrigal Audio Labs, the manufacturer of Marc Levinson electronics. Over the years of sponsorship and, latterly, independence, our interests have dwelt well to the side of art music’s beaten paths. In keeping with that pattern and principle, we encourage contributions from just about anyone who supports, or wishes to expand on, the magazine’s direction.